Home > What's in the Bible? What's in the Bible? a new DVD series from VeggieTales� creator Phil Vischer, is designed to walk children and families through the story of the entire Bible. Each What's in the Bible? 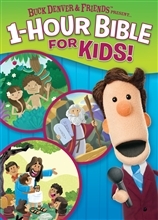 DVD is filled with original music, animation, puppets, and creative scripts which teach children about God and his Word. Children love meeting the new characters including anchorman Buck Denver, Man of News and they'll enjoy singing along with the fantastic songs and will fall about laughing at the fabulous stories.